Capture the cone is a competitive game that kids enjoy. It can be used in physical education classes or as a fun game to mix things up at soccer practice. Set up large rectangular grid with five cones at each end as shown in the diagram. 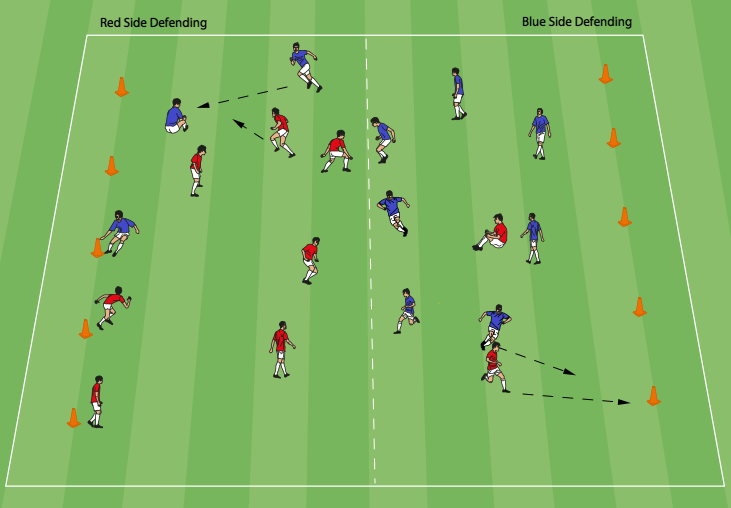 Use cones to mark a halfway line and split players up into two teams. Each team takes a side. Players are ‘safe’ on their own side. The goal of the game is for players to capture the other team’s cones and bring them to their own side. If a player goes onto the opponents side to try to capture a cone and is tagged they must sit down wherever they were tagged. A player can be rescued if a teammate comes by and tags them. Once a player is rescued, both players may walk back to their own side safely. If a player is in the opponents territory but has their hand on one of the cones at the end, they are safe. Once they pick up the cone and try to take it back they can be tagged. This game can be played with running or by specifying different dynamic locomotions for players to do such as speed walking, galloping, or skipping in order to move. Using different dynamic locomotions works best for getting players warmed up. There are many different strategies in this game, for example players can go into opponents territory for a ‘decoy’ run which takes attention away from teammates who can sneak by to get to a cone. Teams can decide if they want to play more offensively or defensively. If you like capture the cone, treasure hunters is a similar game that is also fun. In addition, check out pinnie tag and pinnie grabbers.